← “Deep in the Game” with Avery Jenkins and Discmania are at it Again! 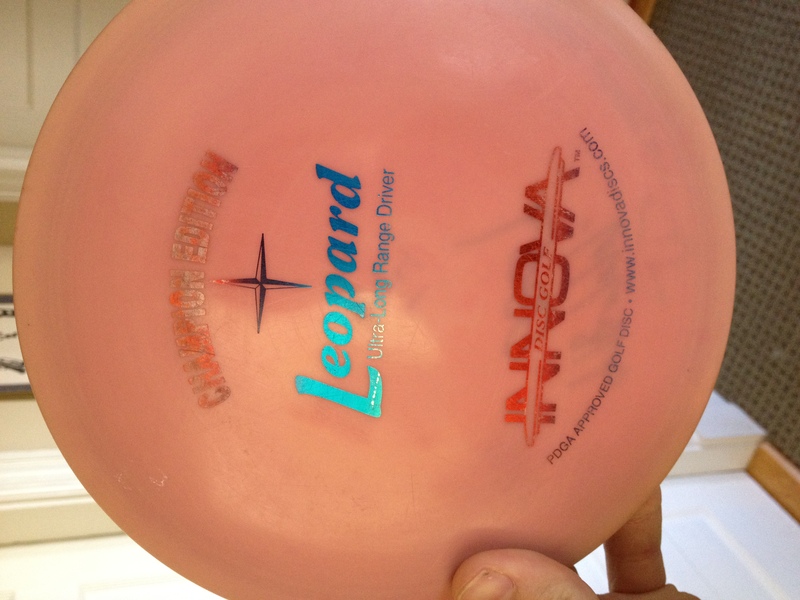 My one and only CE disc- an opaque Innova Leopard. LOVE this bad boy!!! I’ve gone “all Leopard” on my disc golf bag. Initially done out of drastic disgust with my game, it turned into pleasant surprise that dropped my home course average by about 4 strokes. The advice is passed around so often it almost sounds cliché at this point. As Barry Schultz says at the end of this video clip- Find a disc you like, get multiple ones- stable to flippy. I can sum up most of my friend’s disc golf bags with one disc per bag. Boss, Destroyer, Surge, Wraith, Valkyrie, XL, etc… Each bag contains multiple versions of the same mold, but up until recently, my bag was pretty much as random as they got. After this last month however, I committed to the Leopard and now view the disc in a whole new light. Can you throw a Leopard 400 feet? I don’t know- I can’t. Just because a disc isn’t destined for the biggest arms to throw max distance doesn’t mean it’s ONLY a turn-over or a roller disc. The process of forcing myself to throw the Leopard in every situation has taught me more about the flight of a disc in the past month than I had ever learned from hearing the advice of other players combined (sorry friends!). The modern discs coming out now in all their “over-stable” and “top speed” glory are amazing, but they can also cover over the blemishes of our game. I think the familiar feel and rim size of the Leopard are giving me more accuracy, and the simple process of forcing myself to throw it in any situation is teaching me to manipulate the specific flight pattern to maximize the outcome. For example, throwing a 300 foot shot, open field, with a 30 foot incline would normally have me reaching for a distance driver. Perhaps throw a stable Z Nuke, level and straight to the right of the pin- letting it fade in. With the Leopard, I’m forced to throw it harder- which makes the disc flip, so I throw it with a hyzer angle, let it flip to level, and then fade to the pin. I also can’t put any extra height under it since it isn’t a long enough driver for that. Not only is this basic shot important for control (it can be thrown lower, out of the gusty crosswinds in this case), but the Leopard, if thrown poorly, will be more forgiving than say, a Nuke. I can’t imagine a scenario where I flip a Leopard over and fly 100 feet past the hill/pin- but I’ve done that very thing with a Nuke. It’s the same advantage that Tiger Woods has when he’s hitting a 7 iron instead of a 3 wood, even if it’s on a much smaller scale. I’ll spare you the minutia of every epiphany the Leopard has given me in the past month. It all boils down to this: the Leopard is legit. Some folks will say the TL is a longer Leopard. Others will say the Lat 64 River is a Leopard with more glide. It really doesn’t matter- it only matters what we each consider to be our own ground zero- or our “spirit animal” of the disc golf world. For me it’s the Leopard. The sooner we find our own “spirit animal” the better. It gives you something to base your best rounds on, as well as come back to when a round isn’t going so well. If you’re still on the search for your own go-to, “spirit animal” disc: good luck. It doesn’t require a sweat lodge or any peyote, but it will take a good measure of commitment. This entry was posted in Equipment and Gear, Opinions & Technique and tagged disc, golf, innova, Leopard, review. Bookmark the permalink.